I’m so excited to welcome my good friend Iris Higgins to gfe today! She’s sharing her gluten-free Lemon Bars recipe. Okay, she calls them Lemon Squares. I think I’ve called these much-loved classic treats both names over the years. What do you call them? I’m sure we all agree that it doesn’t matter what you call them as long as they’re delicious and you can see from the photo alone that these Lemon Bars (yeah, I’m going with Lemon Bars) are perfectly lemon and absolutely luscious! Hey there! 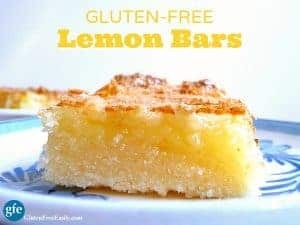 I’m stopping by Gluten Free Easily today to share one of my all-time favorite recipes, Lemon Squares, although some might call these Lemon Bars. I’ve been making these since I was a kid. Now I make them gluten free, and I think they’re even better! My name is Iris Higgins and I used to write a gluten free recipe blog. You might remember The Daily Dietribe. You might not. It’s been a while since I was active in the gluten free online community. You see, I closed down my gluten free blog to focus on my passion: teaching women how to get in touch with their intuition and regain their spark for life. My gluten free blog was actually part of that process for me, fulfilling a need for creativity that was lacking in my life at the time. Today, my business is all about being creative, and the passion I had for dreaming up new recipes has been taken over by dreaming up new meditations, workshops, and retreats. But when I closed down my blog, neither Shirley nor I wanted to see all of my recipes disappear from the web. So she asked me to share some of my favorites with her audience here. This recipe for Lemon Bars is the first recipe I’ll share, and Shirley will be sharing more over time. I’ve learned that people either love lemon desserts or hate them. Me? I will happily eat lemon meringue, lemon pie, lemon cookies, lemon cake…you name it. But my favorite lemon dessert by far is Lemon Squares, aka Lemon Bars. Little chilled bites of tangy sweetness with just the hint of a crunchy top. Seriously. These are everything. Even my friends who don’t like lemon desserts enjoy these. 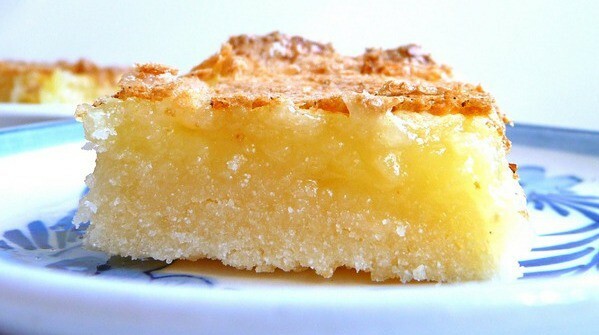 Here’s one more close-up of one of these Lemon Bars before I give you the recipe. I hope you enjoy them! p.s. Although most of my recipes have been taken down, you can download my FREE e-book, Gluten Free Fan Favorites RIGHT HERE. It includes recipes for: buckwheat crepes, quinoa granola bars, banana muffins, English muffins, chocolate chip coffee cake, and more! Iris says: "Little chilled bites of tangy sweetness with just the hint of a crunchy top. Seriously. These are everything. Even my friends who don’t like lemon desserts enjoy these …"
Preheat oven to 350 degrees. Grease an 8 x 8 inch baking dish. Beat together (or combine in a food processor) the butter, sugar, sweet white rice flour, vanilla extract, and water. Press into the baking dish and bake for 20 minutes. Remove from oven. Whisk the eggs, sugar, baking powder and lemon juice together. Pour evenly over the crust, then put back in the oven for 20 minutes. Dust with powdered sugar or coconut flakes if desired. Let cool completely, and chill in the fridge before serving. Makes 9 large or 16 small bars.Note that sweet white rice flour is not the same as white rice flour. Sweet rice flour is also called Mochiko or glutinous rice flour. Iris Higgins, MA, is a certified hypnotherapist and the creator of The Goldilocks Movement, a virtual retreat where she teaches women to embrace their creativity and hone their intuition. She learned to follow her intuition by doing the opposite. For years, she ignored what her inner wisdom was telling her, and it affected her mental and physical health. After years of depression and mysterious headaches and fatigue, she decided to make a commitment to following her instincts and embracing the unknown. Now headache free and full of energy, she continues to happily embrace the unknown while living with her boyfriend and their young son in Prescott, AZ. Wow, the crumb on these looks divine! just the picture grabbed me! and thanks for updating us on the lovely Iris. Hi Becky–Welcome to gfe! 🙂 You could certainly try a cup-for-cup flour substitute but sweet rice flour is unique in its binding ability and texture. To get the same exact results shown and described here, you’d have to use the sweet rice flour. If you have a cup for cup flour substitute that does include some sweet rice flour, you might have better luck. I’m one who likes sticking to one flour mix as well but sweet rice flour yields such great results that I always have that particular individual flour on hand. Still, all that said, if you do try your flour mix in this recipe, please let us know your results. I made them with the sweet rice flour. It took me awhile to track some down in my small Midwest community (I ended up ordering on Amazon). I am see why you said to use that! They were very good. Hi Becky–Yes, Amazon is the source for many of us for certain gf specialty items. So glad you got some sweet rice flour and that you enjoyed these Lemon Bars so much! You’ll find that sweet rice flour is really helpful in a number of recipes—even a small amount as part of the “mix,” so to speak. I use it in my Texas Sheet Cake recipe. I only use 1/4 cup in that recipe but it makes a difference! Thanks so much for taking the time to comment and share your wonderful feedback!